Publisher: Tilbury House Publishers, Gardiner, ME in 1998. Co-authored by Kristine Thorson, illustrated by Gustav Moore. Republished as a new edition in 2014 as a Tilbury House Nature Book. Catalog Copy: A children’s science book explores the ages through geology; accompanied by an engaging teacher’s guide. What can the rocks in old stone walls tell us about how the earth’s crust was shaped, melted by volcanoes, carved by glaciers, and worn by weather? And what can they tell us about earlier people on the land and the first settlers? 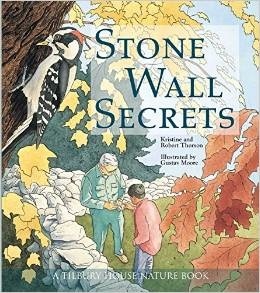 As Adam and his grandfather work together to repair the family farm’s old stone walls, Adam learns how fascinating geology can be, and how the everyday landscape provides intriguing clues to the past. Stone Wall Secrets also shows positive family dynamics between different generations and different races in an adoptive family. Gus Moore’s richly detailed paintings are the perfect complement to a story full of imagery and wonder. Cover: New book cover is an Illustration by Gustav Moore from within the book.